Scene fades into yet another iconic rock song depicting the time and place in history. Forrest trips out and ends up with hippy clothing on while driving a tractor. 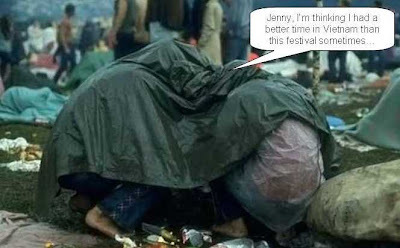 The media catch on to his effort to clean up the trash at the festival. At about this time the helicopter lands and out comes Jimmy Hendrix for his set. Forrest happens to be right there and they bump into each other by accident. Hendrix walks away up to the stage and proceeds to make rock and roll history with an improvised electric version of the Star Spangled Banner on his guitar. VE, this was too cool! Love the Jimi Hendrix part :) Rock on! Life is like a Hendrix Experience. You never know what you're gonna get. good choice. imagine taking all that acid...yes "Imagine". Where were you when Zemeckis was editing this movie VE? The Hendrix Experience would have been great to see. So would Forrest on acid. Kinda makes me want to drop some acid and watch Forrest Gump. I hate it when they leave the good stuff on the cutting room floor. LOL, well done. we just watched this movie this week so it's pretty fresh. 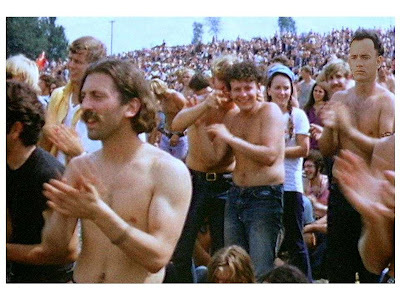 Ah, the lost Woodstock scene. 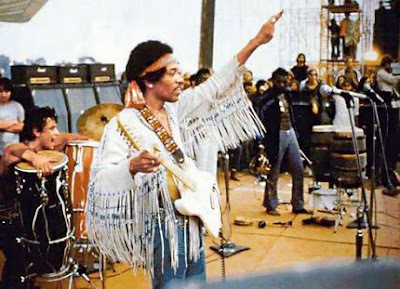 You missed the part where, after dropping acid, Forrest could have sworn Jimi said " 'scuse me while I kiss this guy". freetheunicorns - It was a fun exercise to see if I could splice in something to a well established movie and make it fit. incredible woody - And you wouldn't even have to turn on the TV! Funny is as funny does! Did he meet Jimmy before or after he sang with Country Joe and the Fish? I get chills up and down my spine when you write stories. You write such good ones. It surely would have been funny to have put him there too. I wonder how many other great places they could have put him if they had not spent so much time on his running. Thanks for another great TT. "Life is like a hit of acid - you never know what you're gonna get." quirky - Thanks. A bit of my own experimentation today. I know, I'll try and lay off the kool-aid. R.J. Edwards - You got it! Who was the editor on that film? Guy shoulda lost his job for cutting that! Or was it the suits from the studio who insisted? Buncha squares! Heh, heh! Great take on the theme VE! Very funny, I could really see it being part of the movie! @nonamedufus, a Kevin Barbary( WAAF )parody used this same line! Ha ha! That would have made the movie way cool! Thank goodness Forrest just drank the Kool-Aid and stayed away from the Brown Acid. Great re-write, VE. I finally saw that Forrest Gump movie everyone was talking about a few years ago. Boy was it terrible. This is better. Ahahaha! That was great; it really could have been in the movie! Now I have to unwrap my DVD and actually watch it (I had the tape and finally upgraded but haven't watched it yet). Please take a moment to check out my new LSD Documentary film. Features the CIA LSD Brothel in San Francisco (MK ULTRA), Groucho Marx's LSD Trip....Doc Ellis pitches his no-hitter while high. Tim Leary's Miricle of Good friday Experiment is explored with one of the original PREACHERS who took part. LSD and the Protest Movement, JFK & LSD plus more. All posted for free at this youtube link..please share this knowledge. Oh your good . .really good! Always a surprise over here! I dunno, KoolAid always sounds more like a fundraiser for groovy people. This is brilliant. Did you already have it somewhere in the back of your twisted mind or did the theme inspire it entirely? Would love to see a sequel to that movie! Good 'ole Gump. Always good for a few laughs. uncivil - That would be fun. That was so great! What creativity! LT. Dan would be proud! nice. they should have had YOU write the movie script. it would have been much better! in case i didn't mention it before, that is the most disgusting ice cream cone i've ever seen! otin - Thanks. It was fun. It would be interesting to see what Forrest's acid trips would be like. I picture a "dream sequence" of him doing the twist with the Kool-Aid pitcher guy on the deck of a shrimp boat. Oh, and the Kool-Aid guy has no legs. What can I say that has not already been said. That was an awesome add to the movie. Very creative VE. I liked it! ettarose - Thanks. It was fun. starrlight - The movie blends itself well for adding onto.